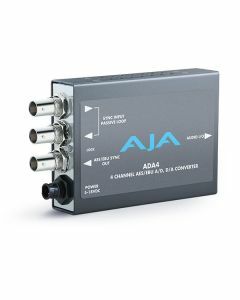 The ADA4 is a 4-channel converter that can be configured as a 4-channel A/D, a 4-channel D/A, 2-channel A/D and 2-channel D/A, or an AES sychronizer. The ADA4 can accept an AES11, wordclock or video sync/color black reference input for synchronization. Reference input and synchronization are automatic. Audio levels are configurable via dipswitch control.